Although he is not listed as a speaker, another prominent American opponent of LGBT equality will also be attending the conference. 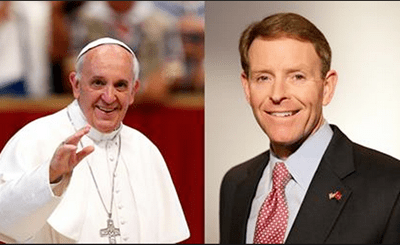 Family Research Council President Tony Perkins said in an interview on Newsmax TV today that he plans to attend the conference in Rome and expects the Catholic Church to “make a very clear statement that pertains to marriage and what the Church views marriage to be” to provide “clarity” to the confusion coming out of the recent synod. And as a special added bonus Tony will be broadcasting LIVE from the Vatican all week! If there were any doubts that the Vatican conference officially named: “An International Interreligious Colloquium on The Complementarity of Man and Woman.” was anti-gay marriage. There are none now. Why some gay men and women cling to Catholicism is beyond me. The clinging you refer to, baffles me as well, because in their lifetime they will never see the church change to their liking..it’s just not going to happen. The reason why Gay Catholics cling to the religion is because we have faith and somethings aren’t meant to happen in our lifetime. Catholicism wasn’t just born the same day Jesus was raised from the dead. It is the story that started it but Catholicism didn’t begin until much later. If you really thing about it Jesus wasn’t a Catholic and he didn’t preach Catholic ideas, he just preached. Next time you need to do a check on your own faith before you start criticizing others. At least some of us are trying to do something about it, change has to come from within.